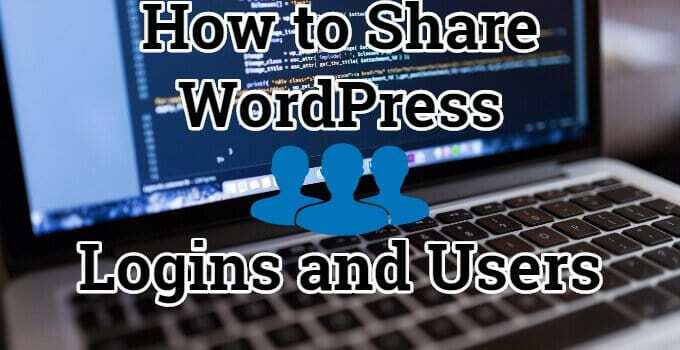 Are you looking to share users and login sessions between two or more WordPress websites? If so, you can learn how to do it step-by-step by following this guide. Recently, I found myself in a situation where I needed to add a bbPress and BuddyPress “section” to a website (we’ll call this site B), although the main website (site A) and site B were supposed to have different WordPress installs. Lucky for me, both websites were hosted on the same server so this made it the whole scenario easier. After I finished it and got it working, I decided to write an article on it to prevent you from some of the headaches I got while doing this. Also, the process could be extended to as many websites as you need. In my case, I was only going to need to synchronize login details and cookies between two WordPress installs. Probably obvious, but you will also need FTP access to both websites, we will be opening and editing wp-config.php for both websites. If you meet the requirements, we can move on. Since we’ll be working with wp-config.php and the databases, it’s best to be safe and run a full website backup, or at least the database and wp-config.php. For this I recommend using Updraft Plus or WP Time Capsule, but just about any other solution will work. I recommend them because I’ve used them many times and never failed me. In order to have the same login and password on both websites, we’ll be using the same database tables. If you’re using the default prefix, these should be called wp_users and wp_usermeta. In most situations, it will be wp_, but if yours is different just remember it because we’ll be using it for Site B‘s wp-config.php too. Keep wp-config.php open, we’ll be needing more info later, as well as to edit it. Keep in mind we’ll be using the same database as Site A, so you will have to use a different table prefix for Site B. In my example, I decided to use com_, short from Community. You can use whatever you see like, it doesn’t matter. If you’re using tools for automated WordPress installation that do not allow you to select the database and prefix, don’t worry about it as you can change them later from wp-config. Just make sure you have WordPress installed in a Subfolder or Subdomain. Open Site B‘s wp-config.php, and replace database name, user, and password to be the same as Site A. Now both sites will be using the same Database. Make sure Site B uses a different table prefix. Please note that wp_ is Site A‘s table prefix. If yours is different you need update these lines. Great job, both sites are now sharing the same users (if you did everything right). Now that both websites are using the same login details, you will notice that if you switch websites you will have to log in again. That can be fixed by sharing login cookies, here’s how to do it. Don’t close Site A‘s wp-config.php yet, we’ll still need some info for Site B. Obviously, you won’t actually find anything in there names stringof40characters, but some different random strings of 40 characters. Next, we need to make sure Site B is sharing login cookies with Site A. Similar to the previous step we will now edit Site B‘s wp-config.php and add the same lines we added for Site A. After you’ve done the steps above, you will notice that your websites are indeed synchronizing login sessions, but you are not allowed to access the admin dashboard. You will be greeted with this error message: Sorry, you are not allowed to access this page. To gain access to it, we’ll need to manually edit wp_usermeta database table. There’s plenty of options to do this, most of you will have phpMyAdmin installed on your server. Personally, I’m using Adminer (a.k.a. phpMinAdmin) because I rarely ever edit the database and I don’t need it permanently installed. 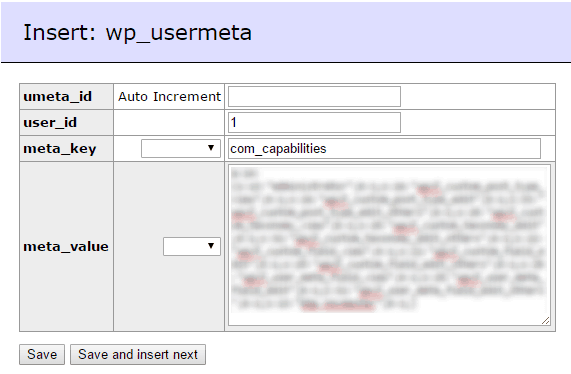 Next, open your Database and go to the wp_usermeta table. If you’re using Adminer too, you’ll have to click Select data to find out wp_capabilities meta_key. When done, it should look like this. And now you’re done, your websites are Sharing Users, Logins and you’ve given yourself Administrator role on site B too.